There is nothing more obvious in the media propaganda advertising Obama’s and the liberal Democrats’ fear tactics to avoid resolving the out-of-control burgeoning Federal debt than the fact that most politicians have no clue as to what the Constitution demands regarding the debt. Sen. Harry Reid’s remark asking “What right do they have to pick and chose what part of government is going to be funded?” is most telling. Under the Constitution the House of Representatives is specifically tasked with the financial oversight of the government. In this current attack on America, the unconstitutional debt has focused attention on the myriad failures of members of Congress to uphold their oath of office. Speaking to the partisan focus aligning those who are supposed to represent us, President Thomas Jefferson in his inaugural address referring to the Framers said “ We have called by different names brethren of the same principle. We are all Republicans – we are all Federalists.” Conspicuously absent from the debate now limiting the Federal government is the consensus of doing what is right and just for all which motivated those present at the Constitutional Convention in 1787. Guided by the truths of science and history, after four months of debate the Framers were in general agreement on the principles of the Constitution except for slavery, proportionate representation, and the regulation of commerce. Educating those in attendance with a reality also expressed in their Christian Biblical worldview gathering as the Committee of the Whole, the most successful and brightest in these former 13 colonies aided by the same “divine Providence” that enabled the miracle of the Revolution accomplished beyond reason brought agreement by the exposition of truth. Principle was not compromised and the Constitution was sent to the states for ratification. In order to secure ratification by the diverse economic and political interests, the states were urged to ratify the Constitution forged not on compromise but on the understanding of truth transcending time and circumstance. In return for ratifying the body of the Constitution, they were promised that the First Congress meeting in New York would address concerns they were invited to attach as suggested amendments. Of the 189 submitted and then distilled directed again by the immutable truths of history, 10 were ratified by the states giving us our Bill of Rights. As to our national debt, the debt ceiling, and the groundless threat of what a default would do, truth and facts need to drown out the lies and deceptions. This debate has been about saving one political party’s face smeared with the economic disaster of Obamacare foisted on the American public without any congressional oversight. Congressional economic failure is simply taxation without representation. The House has attempted to use the debt ceiling issue to focus on sincere attempts to cut spending obviating the need for another increase in the debt ceiling adding to our national debt. Seeking common sense solutions that protect the American people from Obamacare, the House has been stone-walled by Obama and the Senate. Abandoning the public pleas and best interests, politicians are ready to again fail to uphold their oath of office. Crying for relief from Obamacare’s injustices and burdens, the voices of workers whose employers have cut hours to avoid economic strangulation have fallen on deaf ears. Forgetting that the buying power of the American worker decreased 30 to 40 percent with the bailout when Obama first took office, tolerating the injustice accompanying the out-of-control national debt completely overshadows the economic devastion of the inflation effects of the too soon forgotten policies instituted by those we have elected. With the taxation of Obamacare added to the diminishing real wages, American workers will soon again experience the consequences of Congressional failure to protect and defend the original intention of the Constitution. Does anyone care that Congress is attempting to exempt itself from Obamacare with Obama’s approval? Since Obama came into office, the debt limit has been raised seven times, and with those increases, Congress has added $43,000 in debt for every American household in just the last four years. Now with the debt limit again being raised by those repeatedly violating their oath of office, every American is being sacricifed to the forces attacking us. Increasing the debt limit as is now in process of being tolerated by the House means the national debt would rise to $17.8 trillion. Somehow that does not seem to fulfill the intention of the Constitution to “secure the blessings of liberty to ourselves and our posterity”. Understanding that our government collects an average of $206 billion a month, that the average per month interest on our debt over a 12-month period is $35 billion which is what the federal government pays pertaining to our nation’s debt, it doesn’t take a rocket scientist to realize that there is more than enough to service our national debt and pay for other essential obligations. Additionally, Obama has the ability to prioritize which bills to pay first and a constitutional obligation to pay the debt first. The Fourteenth Amendment, Section 4, states: “The validity of the public debt of the United States, authorized by law, … shall not be questioned’ … . The federal government must pay its debt obligations, both principal and interest, even if that means prioritizing debt service over other government spending such as funding those able to but unwilling to work and those undeserving of welfare. If Congress does not raise the current debt ceiling, this is the perfect opportunity to cut the “pork“, trim the Federal bureaucracy, limit Obama’s $100 million vacations, and reclaim America. President Obama’s efforts to make the partial federal shutdown as painful as possible for the American people extends to closing down memorials and sporting events that don’t receive any federal money. In fact, extra money is being spent during the “shutdown” to pay the personnel necessary to frustrate Americans and seal off these attractions. And in the case of the effort to scuttle military athletics, it would cost additional millions in lost revenue from tickets and concessions.That’s the topsy-turvy world of Shutdown Theater – an elaborate production designed to make Americans hurt, conducted by Democrats convinced the media would blame it all on their opponents. It’s not working out that way. It doesn’t help that his pals in the pressforgot to switch off the cameras when Senate Majority Leader Harry Reid started talking.The American people might well ask themselves why they’ve ceded so much liberty and money to a titanic government that can’t do anything right… except make them suffer when its demands are not met. Just think how much worse next season’s Shutdown Theater will be, once ObamaCare allows Democrats to take your doctor hostage. Of course, to reach that day of total submission by the American people, they’re going to have to engineer a flytrap that does something other than crash when victims wander in. Here’s a running tally of recent measures passed by the House of Representatives through 5 October, almost all of which are being blocked by Senate Democrats and President Obama who refuse to negotiate with Republicans to fund our government. Speaker Boehner appoints negotiators to a formal House-Senate conference. See the full list here. Provide Local Funding for the District of Columbia Act (H.J. Res. 71): allows our nation’s capital to continue operating using its own funding. (Passed in the House by voice vote). “Neither a borrower nor a lender be,” wrote William Shakespeare in Hamlet. As the Founders were exceptionally well read men, they surely knew the reference. And it’s clear that, when it comes to governing a nation, the Founders were nervous about allowing it to run up too much debt. There is not a more important and fundamental principle in legislation, than that the ways and means ought always to face the public engagements; that our appropriations should ever go hand in hand with our promises. To say that the United States should be answerable for twenty-five millions of dollars without knowing whether the ways and means can be provided, and without knowing whether those who are to succeed us will think with us on the subject, would be rash and unjustifiable. It is worth noting Madison’s concern here for future generations. That’s us, and we have him and his fellow Founders to thank, because they bequeathed us a successful and prosperous nation. We should also ask whether we’re living up to our end of the bargain. The simple answer is no. Consider the $25 million Madison mentioned borrowing. Well, on a given day in August, the federal government spent almost $6 billion more than it took in. We borrowed $250 million each hour of that day, more than $4 million each minute. And that’s not the total amount we spent—just what we borrowed. The bill, with interest, will be passed along to future generations. Madison wasn’t alone in his concern about excessive borrowing. It is a wise rule and should be fundamental in a government disposed to cherish its credit, and at the same time to restrain the use of it within the limits of its faculties, never to borrow a dollar without laying a tax in the same instant for paying the interest annually, and the principal within a given term. Of course, in his personal life, Jefferson wasn’t renowned for being a wise steward of money. But here he recognized that as a nation it’s important to protect our ability to borrow by making it clear to lenders that we have a plan to eventually pay them back. This year alone, our government has shelled out almost $400 billion just to repay interest on borrowed money. That’s more than the entire budget of the Canadian government. No nation has ever spent money on the scale that the United States does. It’s important to change course. And quickly. “No pecuniary consideration is more urgent, than the regular redemption and discharge of the public debt: on none can delay be more injurious, or an economy of time more valuable,” George Washington warned lawmakers in 1793. 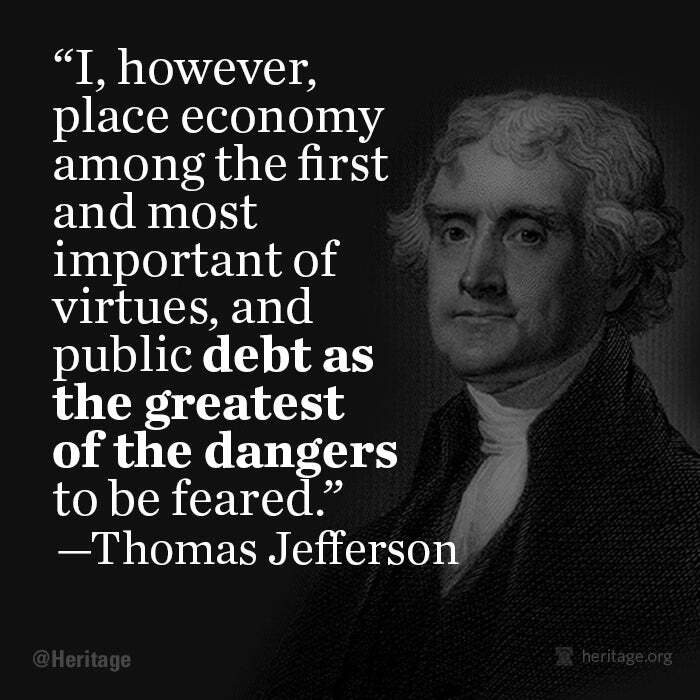 As the country approaches—and smashes through—the debt ceiling once again, it would be wise to take the father of our country’s words to heart. Rather than borrowing trillions more, we need to begin paying down some debt before it crushes us. The Founders of the United States wanted to establish a country that could endure for generations, and they understood that massive debt would endanger their project. They knew that managing public finances to force government to live within its means was the prudent thing to do. They understood that it would sometimes be necessary for the country to run a deficit—for example, during times of war—and that this would lead to debt. They had recently come through their own revolution successfully in large part because they were willing to borrow heavily to pay their bills. Still, the Founders generally disapproved of debt and believed that the amount the country owed should be limited. The U.S. was in debt even as it was being born. In 1776, the most important task facing the Founders was to win the Revolutionary War. If the colonists had been defeated, the leaders would have been executed (“We must all hang together, or assuredly we shall all hang separately,” in Ben Franklin’s memorable phrase), and they would never have been able to secure the nation’s independence. So they borrowed heavily to pay for the war. After the failures of the Articles of Confederation, the Founding Fathers gathered in Philadelphia in 1787 and drafted the Constitution. It created a federated republic with powers allocated between the state governments and the national government. But it did not solve the problem of individual state debt. In 1789, the U.S. Treasury Department was formed, with Alexander Hamilton as the first Treasury Secretary. Hamilton convinced Congress to assume all state debt that remained from the Revolution. That would require the new national government to run in the red, but Hamilton was not worried. “A national debt, if it is not excessive,” he argued, “will be to us a national blessing.” By this he meant that, if interest on the debt were paid regularly, the country would begin to build a positive reputation. Stanford law professor Michael McConnell writes that such a debt “would become a kind of liquid capital—a ‘blessing’ in a world where gold and silver was costly to transport and use for transactions.” As investment flowed to the new U.S., capital would be created. Thomas Jefferson, then serving as Secretary of State, vigorously opposed Hamilton’s plan. He wanted strict limits on how much the government could borrow and for how long. The Secretary of the Treasury won that argument, and his plan proved effective. Hamilton was able to issue federal bonds to cover the national debt, which he estimated at about $77 million. Because federal borrowing was limited, his system helped consolidate the debt and allowed the federal government to make its interest payments on time, thus building credit. The value of the new federal bonds quickly increased. This helped move the country away from Jefferson’s agrarian dream and toward the commercial republic Hamilton hoped it would become. Of course, it was also crucial to cut spending. That happened quickly, and by 1793, the government showed its first budget surplus. But the Louisiana Purchase and the War of 1812 combined to increase the federal debt once again. Public debt soared from $45.2 million on January 1, 1812, to $119.2 million in 1815. Andrew Jackson was born in the generation that followed the Founding. He hated debt and vowed to pay off the entire national debt. By selling off land holdings and slashing spending, Jackson succeeded in 1835. His accomplishment did not last. First there was a massive national depression, then a series of wars that forced Washington lawmakers to borrow over the years. Still, defending the country is one of the national government’s core responsibilities. It should run deficits when necessary to protect the homeland. In fact, the idea of a statutory debt limit arose during war. In 1917, during World War I, Congress passed the Second Liberty Bond Act to allow the Treasury to sell long-term bonds. To make certain the debt did not grow out of control, lawmakers included a limit on how much the government could borrow. That limit would be raised a few years later, again during a war, when Congress voted to allow the debt to reach some $300 billion at the height of World War II. Yet when the fighting stopped, the government always took steps to pay down debt. Large deficits in peacetime were frowned upon until relatively recently. For example, excepting the World War II years, the U.S. ratio of debt to gross domestic product (GDP) was almost always below 50 percent until the end of the George W. Bush Administration. In just the past five years it soared to almost 75 percent of GDP and is expected to top 100 percent around the year 2028. As the country approaches, and smashes through, the debt ceiling once again, it would be wise to take Washington’s words to heart. Rather than borrowing trillions more, the United States needs to begin paying down some debt before the burden becomes crushing. —Rich Tucker is senior writer in the B. Kenneth Simon Center for Principles and Politics at The Heritage Foundation.